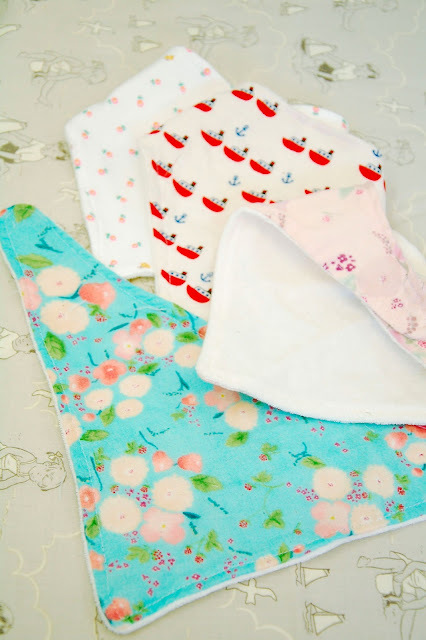 The clever ladies at Eternal Maker recently posted a great little tutorial and patterns for making an ever useful baby bib bandana. 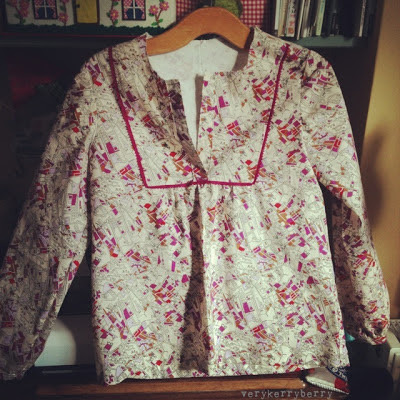 Its perfect for a quick baby gift and a useful make for left over but of soft pretty fabrics. 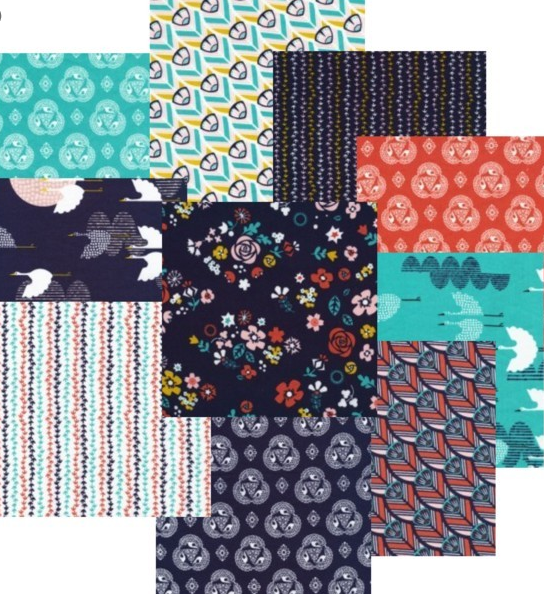 This lead me to the huge range of soft pretty fabrics at Eternal Maker and these are my picks for May. Little Letters in Peach from Nani Iro (by Naomi Ito) is heaven, two layers which are fixed together so you just treat is as one. It has great drape and is both warm and cool to wear if that makes sense! The big advantage is the feel of a floaty fabric but you can safely make a dress without thinking everyone can see your knickers. Karen of Did you Make That? 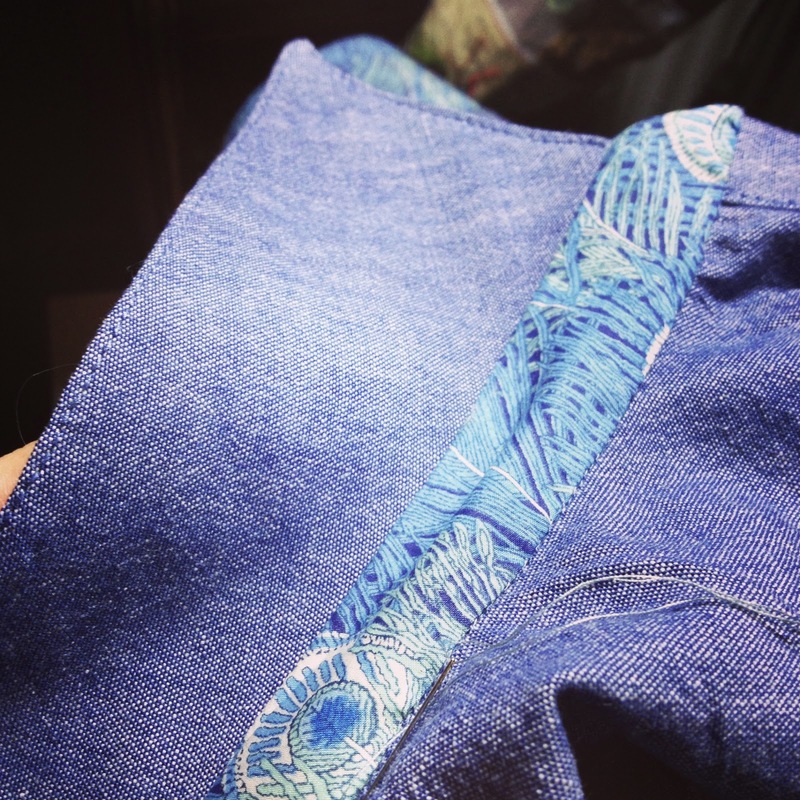 has a great post on dress making with gauze, am inspiring and funny read. Peaceful Cooing (another Nani Iro), this is the double gauze woven version of the beautiful print I used for my scoop tee- fantastically summery (summer will come eventually, I'm sure). 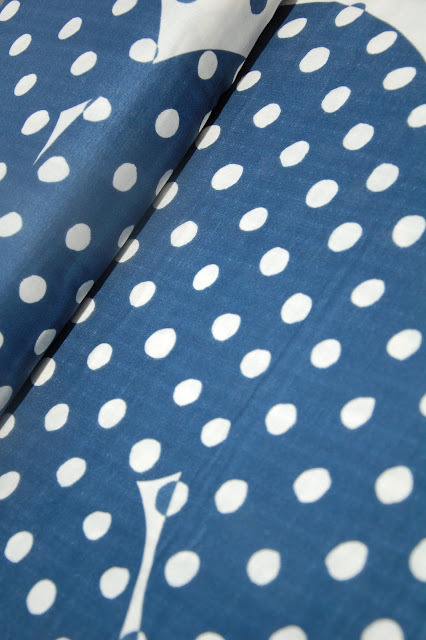 I know not everyone likes a floral, this navy Poncho print is a version of a polka dot. 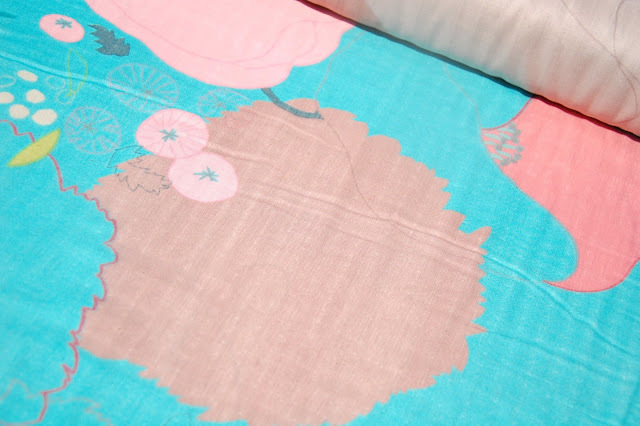 This fabric comes with a border which is nice to include in the design whether it is clothing or quilts. 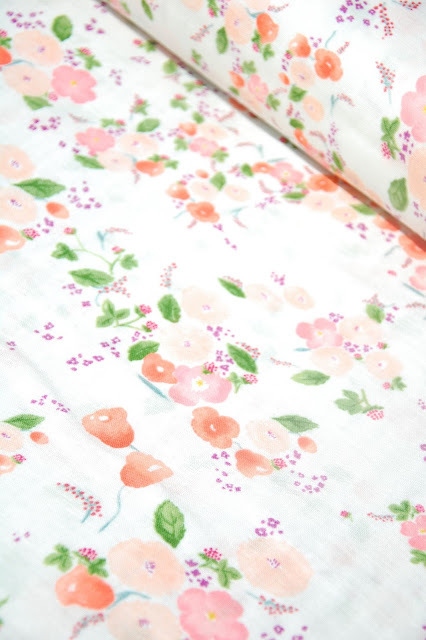 You can see it with the border at the Nani Iro website (this is one of their pics). There are lots of free patterns on the website too. 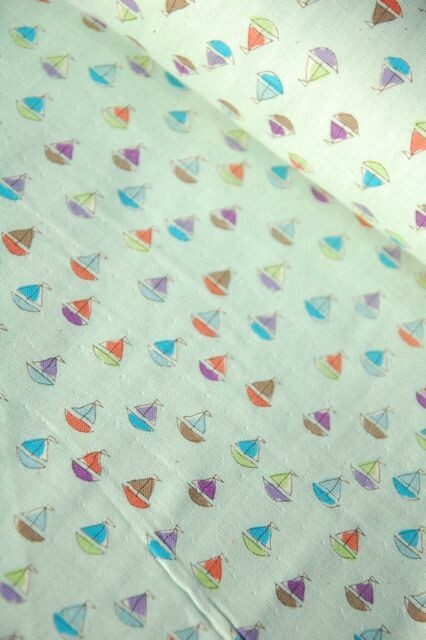 If you are looking for babies/children for quilts and clothes, there are lots of cute prints like this Kokka boat fabric. You can see the tiny dimples where the layers are held together on this pic too. Eternal Maker also sell the terry towelling mentioned in the tutorial which makes a great bib backing as well as being suitable for burp cloths. It has a short pile so reducing bulk whilst retaining absorbency and is extra wide making it good value too. The clear fasteners are available too. Draped in your double gauze, in the words of Larry, "Float, float on..."
I've been working on one dress, Bleuet, all this week full of Me-Made- May 13 fervour and hugely inspired by this Bleuet by Anna. I ended up finishing it mid week. I am so pleased with the result. I have never made or even bought a shirt dress that suited me or fitted properly. I have fitted this dress with its princess line panels so that it fits perfectly with room to move and whilst retaining its shape. The fabric is organic cross weave from Saints and Pinners and it is perfect for it. 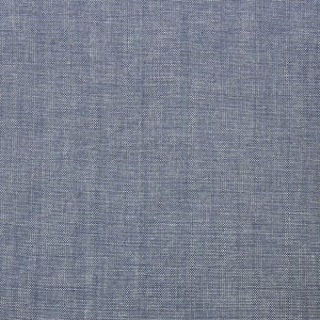 Thicker than poplin or shirt weight, lighter handle than denim and a wonderful blue. 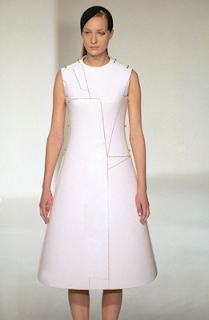 I did an HNC in fashion years back and a big influence at the time was Hussein Chalayan and his 'Before Minus Now' dress collection. 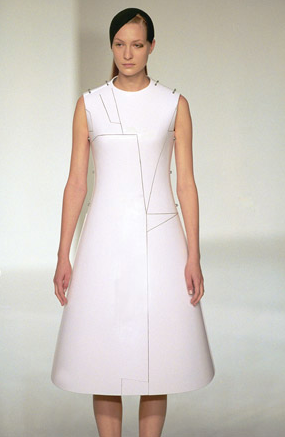 The dresses were beautifully shaped- I've seen a couple in the V and A, they worked 360 degrees all around the body. The Bleuet reminds me of them. It moves outwards and over my backside and belly in such a flattering way. It is incredibly comfortable and easy to wear. The bow detail at the back is so easy to do but the neatest detail and what sold the pattern to me in the first place. 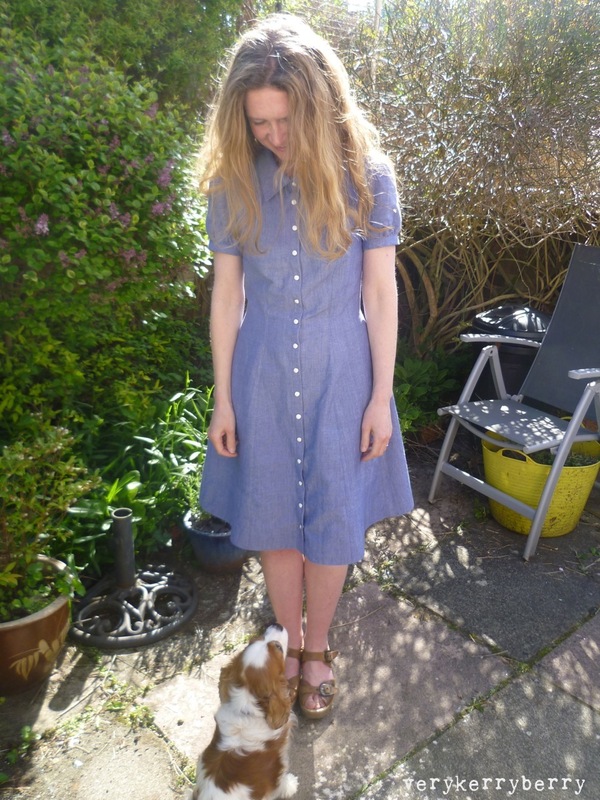 A photo shoot isn't complete without Lottie rushing in to be in the picture. Once I finished this I ended up buying two more Deer and Doe patterns. The styles are so well cut and seem to work for me with relatively straightforward alteration on the top half and non on the bottom. They deliver quickly at low cost- no higher than ordering from UK. Do be warned that the instructions are scant- I relied on my own knowledge and the ever helpful Readers Digest Guide to Sewing (the best dressmaking guide you can every buy). I have the copy that got me through O lever dress at school and it is incredibly comprehensive. For those wanting to make Bleuet, these are the details of my changes. Traced size 36 top half/ 38 waist/38 hip/46 length. The lines blend as you move from size to size a bit like dot to dot. The sleeves were a little tight under the arm so those seams were sew with 1/4" seam allowance which made for a good fit. One layer of medium woven cotton interfacing rather than two for the collar, non for the cuffs- there are five layers of fabric there, it hardly needs more structure. I do find pattern designers a little over obsessed by interfacing. I used Prym pearl snaps bought from an ebay seller at a very reasonable price. I have Prym pliers for these which from past experience I have found essential for successful snaps. I used 16 snaps altogether. The hem facing and collar stand facing are made with a thrifted Liberty shirt ( I was squeezing this dress out of just 2 metres of 120cm fabric so creative cutting was needed). The fabric I used is a steal at £10 a metre at Saints and Pinners at the moment as there is a 20% discount for all purchases over £10. 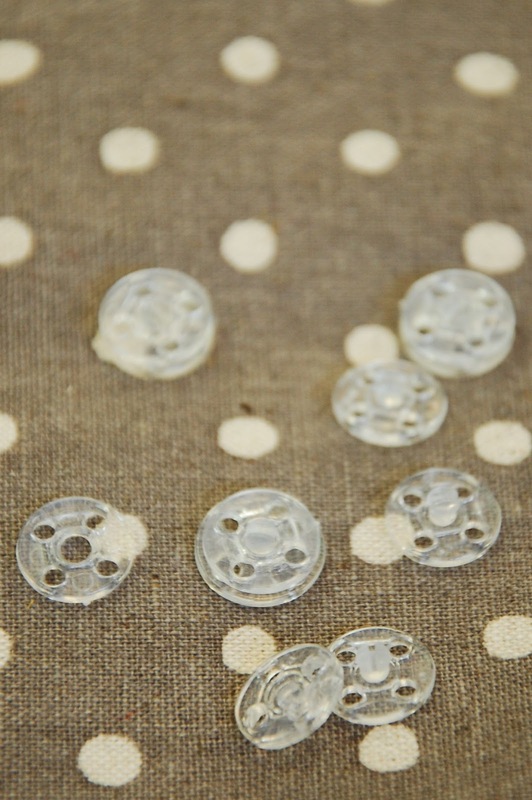 Fabric of this quality, organic as well, is hard to find for dressmaking. It definitely needs pre washing as it will shrink and needs a colour catcher on its first wash and probably its second but the handle and texture is beautiful. Its also available in blue the blue in my dress photos captures the colour better) and pink (see Jo's Madeleine skirt in the pink/red here. They would both be good fabrics for bag making too. No code is needed for the 20% discount at Saints and Pinners and there are other treats for dressmaking there such as this, this, this and this as well as the usual quilting cottons. 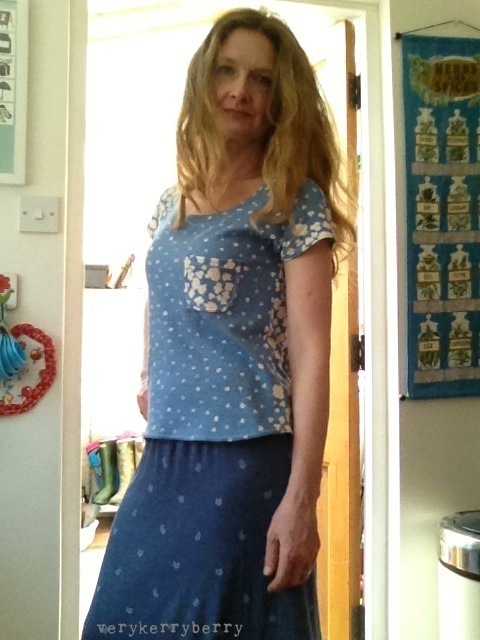 Self photography is a tricky business so what follows is mainly a selection of dodgy selfie iphone shots with some of my weeks 2/3 Me Made May 13 outfits. I made this Airelle top a few weeks back with some Grayson Perry Liberty lawn which was an ebay bargain. 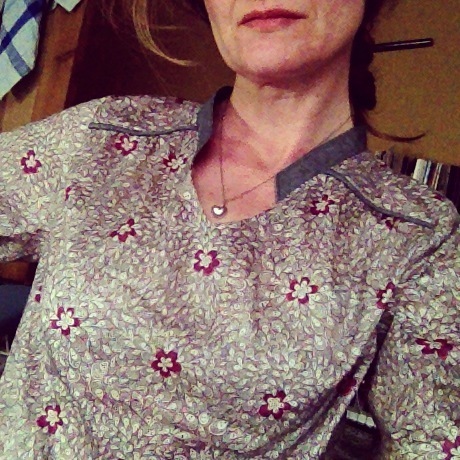 It needs a proper photo as it is a lovely slightly fitted blouse and has really given me a new pattern company to love- Deer and Doe. I made a size 38 (UK 10) and altered the bust. Although I am narrow in the chest I hate any sort of restriction in the sleeves or shoulders so I find this size and taking in the sides and the chest works best and is my standard adjustment for lots of tops. There are waist and back darts for gentle shaping and the shoulder line is created by front and back yoke. The sleeves are a lovely fit, especially around the armscye/armhole. I did manage randomly place two of the central flower motifs rather creatively placed like pasties on my front! It's a little gappy around the V so on the next one I will adjust it on the front at the shoulder by the neck so this lies flat. 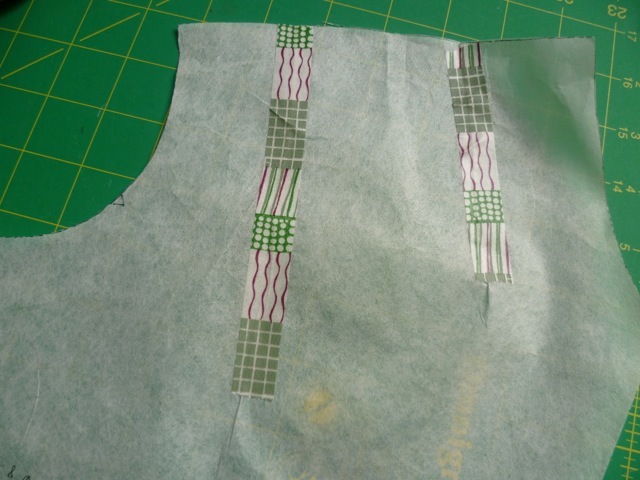 I reduced a little fullness on the pattern piece by taping down with washi tape. I generally use Swedish tracing paper for pattern pieces. Tracing is not my favourite part of dress making and this makes life easier. It is soft and strong, does't crinkle and tea like paper and take up loads of room flapping around. Its popular stuff and hard to get in the UK, Annie has had some in and it has already sold but more is coming. 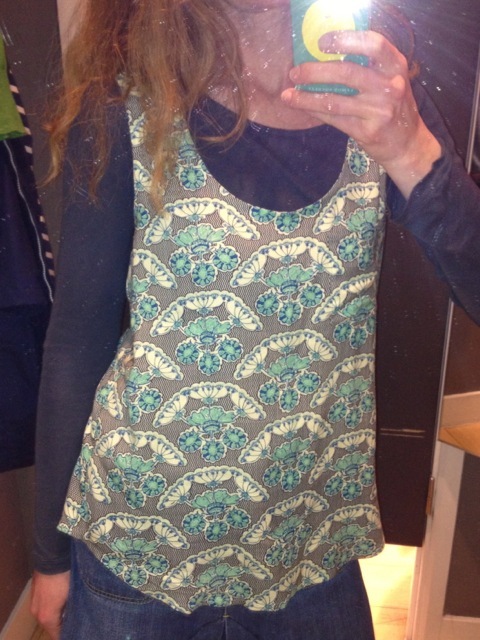 I made this Wiksten tank a couple of months back using Field Study Rayon bought here. 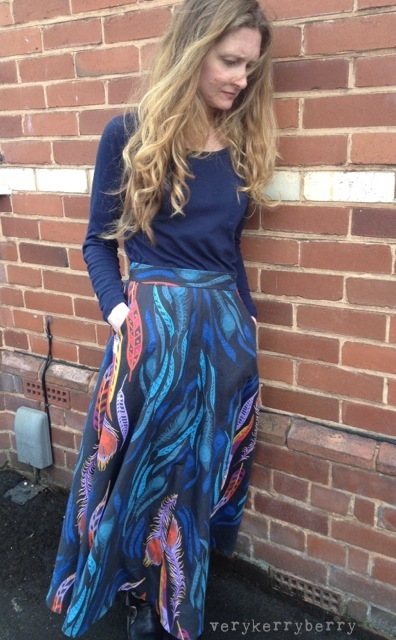 The fabric practically falls on the body, it clings and flows in a very flattering way. It is also tricky to cut- scissors rather than my usual rotary cutter preference. It needs gentle handling and sharp pins as it will snag easily. As a result, I went with an easy pattern shape. No darts so good for a small bust, although I found that as rayon drapes so well, the tank came up looking a little big and I could have gone down a size- I can't wear it without something underneath as it looks too loose but the print is so pretty and the flow of the fabric is such a pleasure to wear, I am happy to layer it. Sometimes I can persuade my daughter to take pics. 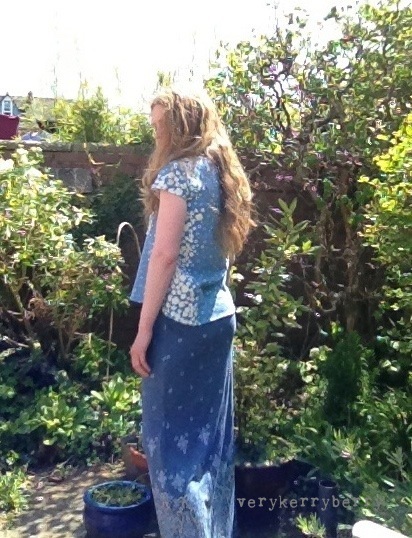 This is my latest Lonsdale skirt made again with Anna Maria Horner Field Study but this time linen/cotton from here. 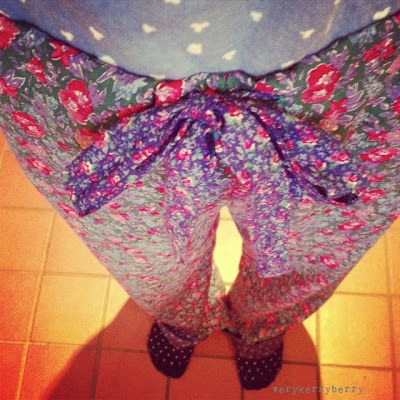 I made these PJ pants in preparation for my Fat Quarterly retreat class. I have 3 pairs, all a little different and a 4th pair planned to show the construction techniques involved. There area few alternations to the original Simplicity pattern which are part of the class- adding leg hem cuffs, adding a wider part elastic/ part draw waist tie. These were made entirely from thrifted fabric, soft twill weave florals. And finally a dress from last year, Simplicity Cynthia Rowley 1801. 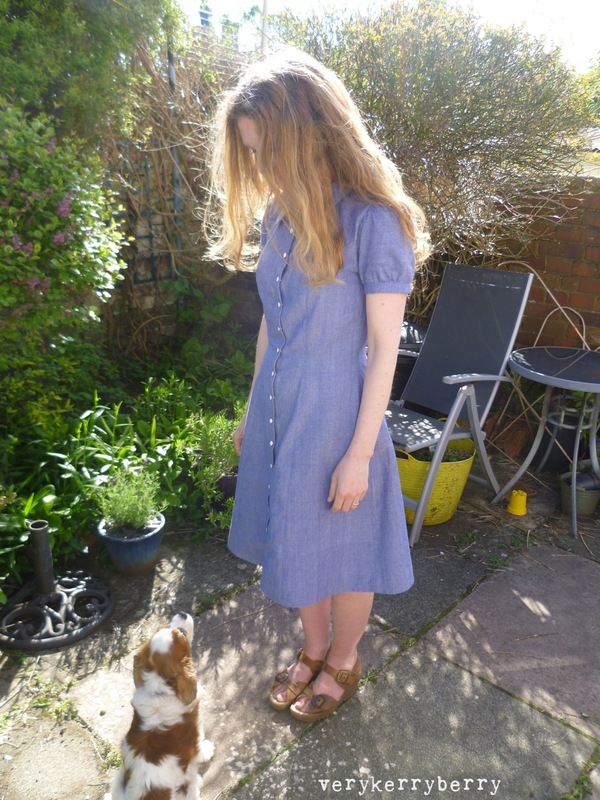 I like this dress, good pockets, the right length, gathers front and back and not at the sides on the skirt all works well but I do lack the fun bags at the front and if I fitted this really well it would not be flattering. I wore this on a little shopping trip with my sis. We tried on stacks of clothes in a local dress agency and gave each other honest opinion- yay or nay on how we looked. 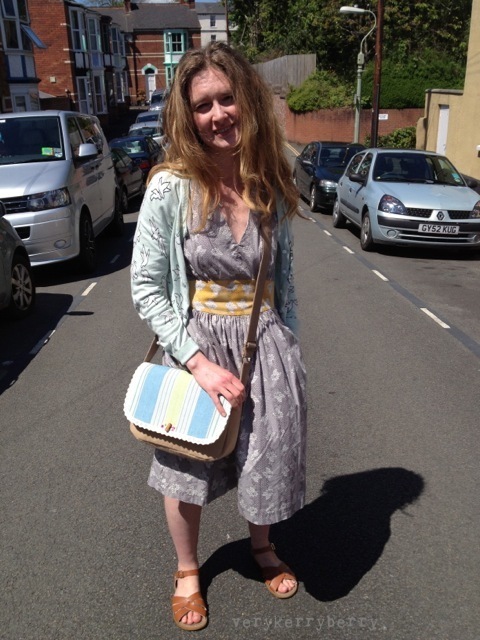 I came out from the changing room in this dress and she shook her head- no not that one. I had to point out this is what I came in. Its alright, she's my sis, I forgive her and she has a point! I have been crazily dressmaking inspired by Me Made May 13. Moderation is a hard thing for me; it's all or nothing and although I constantly try to amend this it doesn't seem to happen. Prepare yourself for a rather picture heavy post. I have been making a lot of tops because tops and skirts is what I wear when I am not at work. 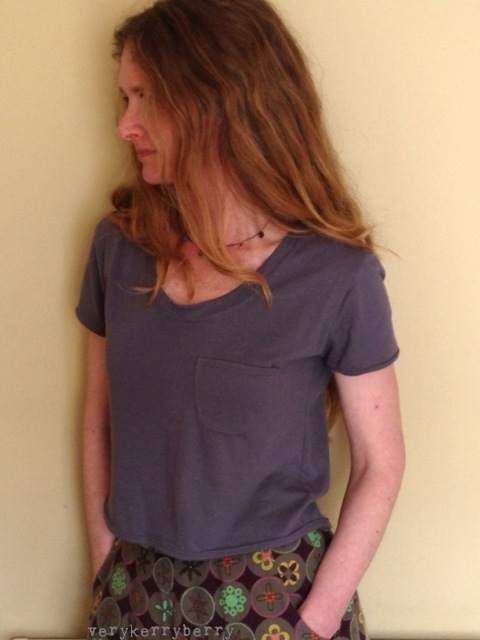 (work is jeans and work t shirt so I never wear jeans out of work). This post is knit tops and another post will follow with other clothing . 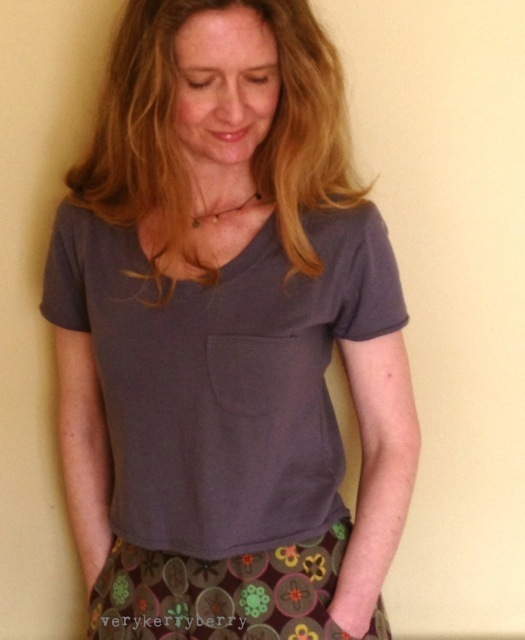 This T shirt is a free download from Kristin of Skirt as top. It comes in one size which is small (around 10-12 UK sizing. 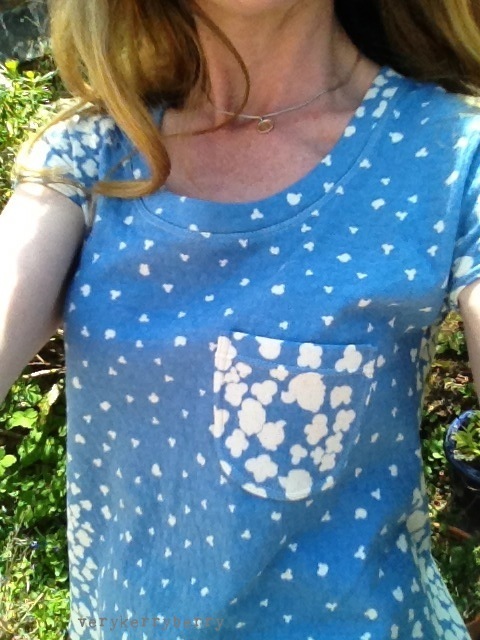 I made it a little narrower on the sides and added a self drafted pocket. 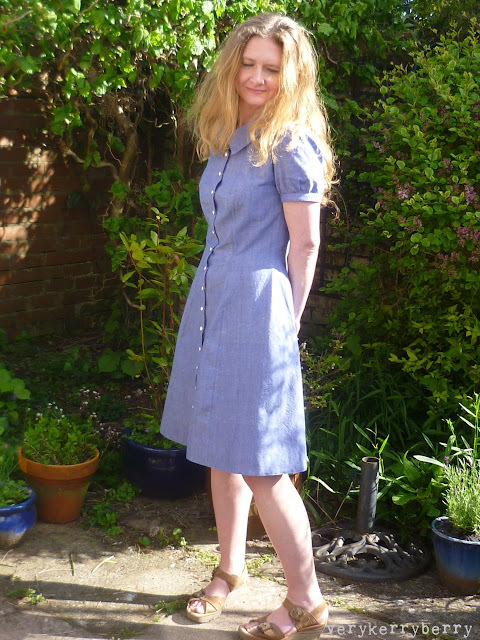 I also shortened the pattern all round by 1" as I am quite short in the body. 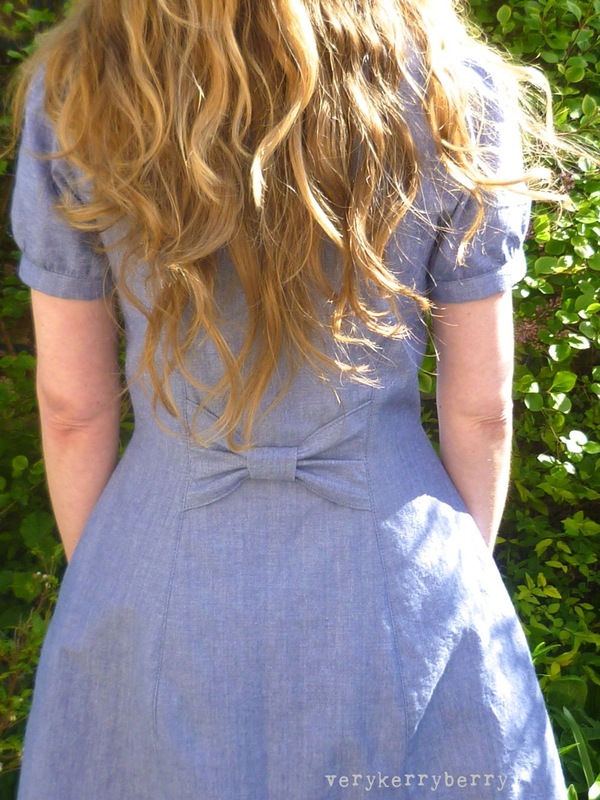 It makes a lovely T, lightly fitted at the top and loose at the hip with a dip hem lower at the back. 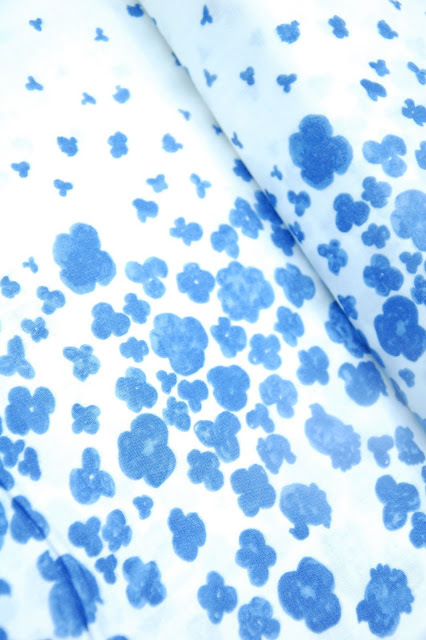 As the sleeves are part of the front/back it is very economical on fabric which made it perfect for the Nani Iro knit (this print is gone at Eternal Maker and Village Haberdashery) which is only 80cm wide. 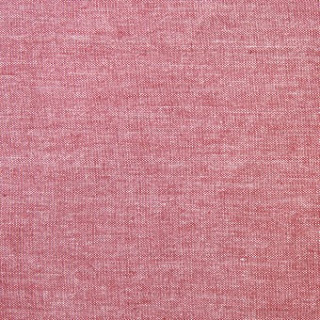 This Nani Iro knit is double layered, a bit like double layer gauze, and is very soft. 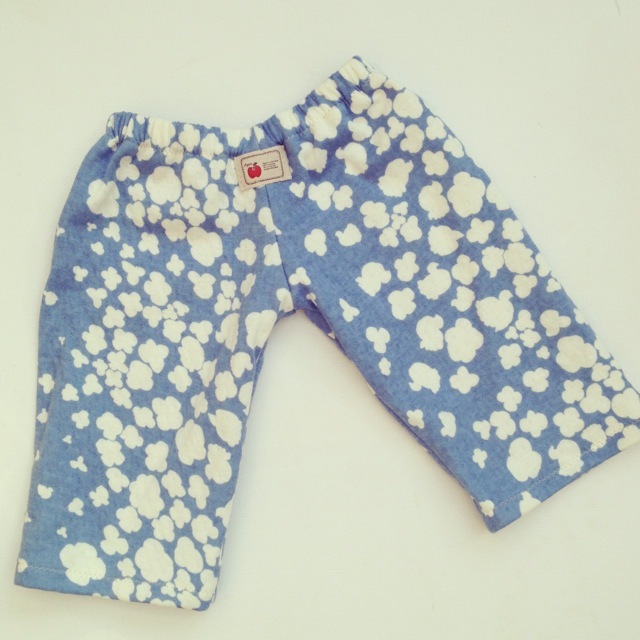 Eternal Maker sell the same Nani Iro knit in a different print/colours here. I will definitely make more of these! 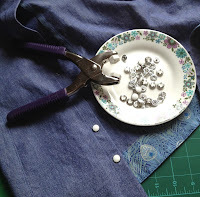 Kristin has included all the making instructions on her blog and it can be made on a standard sewing machine. I mentioned Meg McElwee's Craftsty knit class before- it is a great class. Cotton jersey is the easiest knit to work with, especially if it is 100% cotton as the stretch is easy to control and the fabric behaves itself when pressing/cutting etc. 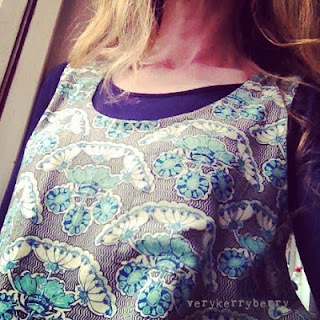 Viscose jersey (like the floral jersey top in this post) is much harder and slips and slides more. 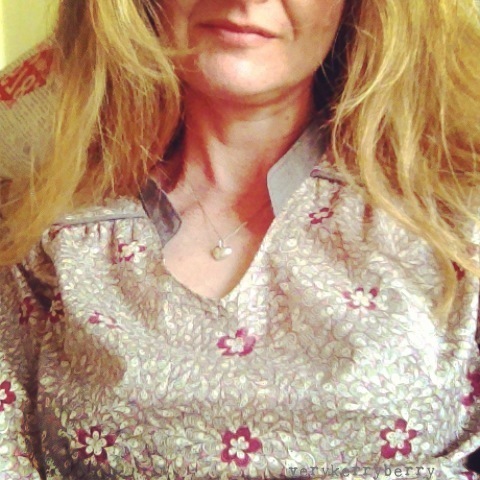 This is organic cotton jersey from Eternal Maker and I managed to squeeze a long sleeved and a short sleeved T out of 1 1/2 metres. This is size XS and fits really well. I gained a lot of confidence working with knits from Meg's class and it comes with a stack of knit patterns which made it an economical buy. I wear long sleeve knit tops like this all through the year so this is a great basic. This is the shorter T that I squeezed out of the left over jersey. Megan Nielsen Briar pattern, in XS. I went for the short style and cut straight across the front and left the back as the pattern with the dip hem. Fit is just right, no alternations. I underestimated this pattern. I thought it was going to look like an 80s crop top but actually this ends up at the perfect length for the large collection of A line higher waisted skirts that I am currently creating. Again, I see this as a wardrobe staple. The hardest areas for me to fit are armscye/armhole and bust. With knits, bust is not really something I have to think about (relief) and the shoulder line/armhole is perfect for me on this. Having seen all the different versions all over different blogs I know it will work with lots of variation lengthened/long sleeves etc. Maybe even as a cardigan or a woven? I think it's worth a try- I love this one a lot! I can't wait to make a version in the new Elk Grove knits! And the best thing about making it in this length is that it hardly takes any fabric. I have found all the dress making highly therapeutic. You have to look at yourself objectively when you make your own clothes, accept the lumps, (lack of lady lumps in my case) bumps, short bits, long bits and work with and around them. I have had issues in the past, eating disorders in my very stressful early 20s, thankfully long behind me but body image is a toughie. Making my own clothes helps. They have to fit so sizing goes out of the window- one style like a dress might involve 3 different sizes at the bust waist and hip. You also have to be prepared for a little failure- getting it right first time is the exception and sometimes you need to accept that you get it wrong. Wrong fabric, wrong style, being swayed by what looks good on others but will never work on you- I've done them all and I still do it despite over 25 years of making my own clothes. 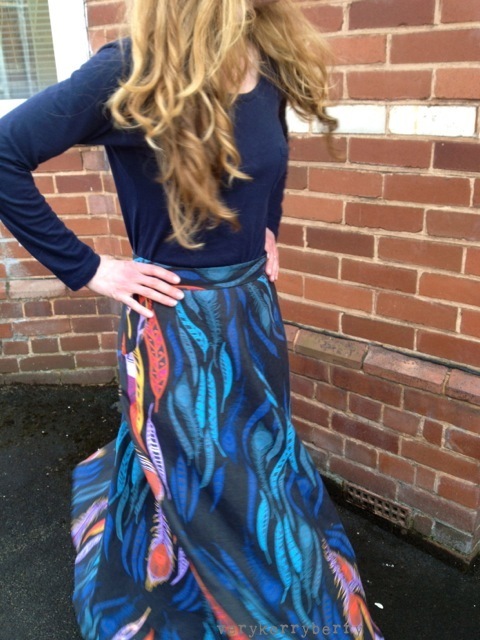 My most recent failure was a Tova- not the style but the fabric choice. Too busy, too small a print, too much going on. At the moment it hangs in the sewing room so I can ponder it, and as a little reminder that not every fabric you love will make great clothing! Reuse, recycle, I am guessing this will chop and end up in a quilt. Catching up with a few bits and bobs. 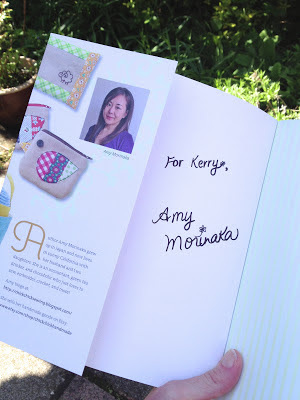 I am kicking off Amy Morinaka of Chick Chick Sewing 'Zakka Handmades' book blog tour in June and she sent me a copy of her book through the post and it just arrived. I thought it was time to sort my facebook stuff out and have now added a Verykerryberry facebook page. All blog posts and Instagram photos will go on there for those of you who like to press like (see what I did there, such wit) and follow progress on book face. There is a like button in my right hand sidebar too and this pic is there to greet you- scarf made by Amy and much worn by me in the never ending slightly too cold weather. 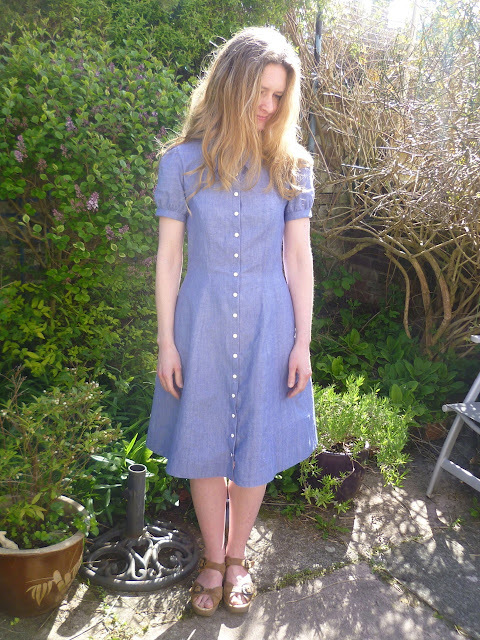 I have done so much dress making lately, powered by the Me Made May initiative. I am not so good at getting photos of me wearing it all but I will get a post done hopefully tomorrow of the latest makes. I am starting on this Bleuet dress by Deer and Doe (greatly inspired by Anna's perfect version here). I am planning on using this organic blue crossweave from Jo and Fran at Saints and Pinners ( fingers crossed I ordered enough! I have been starting my prep for Fat Quarterly retreat sewing PJ pants and prepping the fantasy fabric shop class- train tickets are bought, it is only 2 months away! And a huge thank you for all the lovely comments and emails about 500 Quilt Blocks book that Lynne and I have recently been able to show you! A few of you noted the similarly titled/covered book on Amazon- no worries, it is a phantom listing that is put up in the early days of the title by the publisher, ours is the real deal I promise! The cover that you can see on ours is a mock up and I think there will be different covers for the different publishers it is going to be printed with in different countries. We are looking into book plates at the moment too! I can't wait for when we get the go ahead to show you more of what's inside! After the May madness of the one day mega sale at Village Haberdashery when all sale fabrics were half price, Annie has been clearing way for new stock. (To ensure you hear about such offers, check out my twitter feed and Annie's). 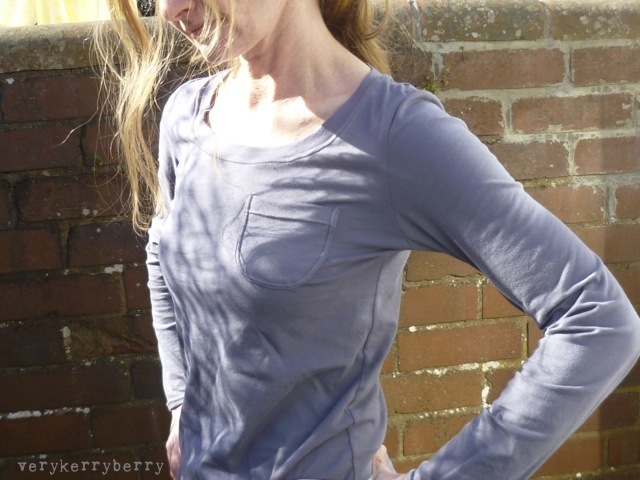 There are some wonderful Birch fabric knits- all organic-that I will be making a Briar from and I will blog all my knit sewing tips- I have been making a lot of knit tops this year and feel like I have overcome the stretch fabric fear! 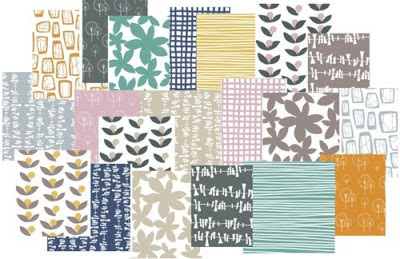 So meanwhile, this fabric range has come in stock, Lotta Glimma. I enjoy each Lotta collection and this is no exception, There are some echos of Bella and the first collection and I like the scandinavian dusk style colour palette. These are all quilting cottons and I particularly like this fabric for dresses as well as quilting. It would work beautifully in the Bella Mountains duvet cover I made for Village Haberdashery. There are also canvas fabrics in this collection, perfect for bags, cushions and even curtains or a window blind. Rashida Coleman-Hale's Tsuru collection has some beautiful prints. The navy blossom festival floral especially catches my eye. Her next collection Koi, which includes voile is coming into stock soon too. A little pattern temptation? 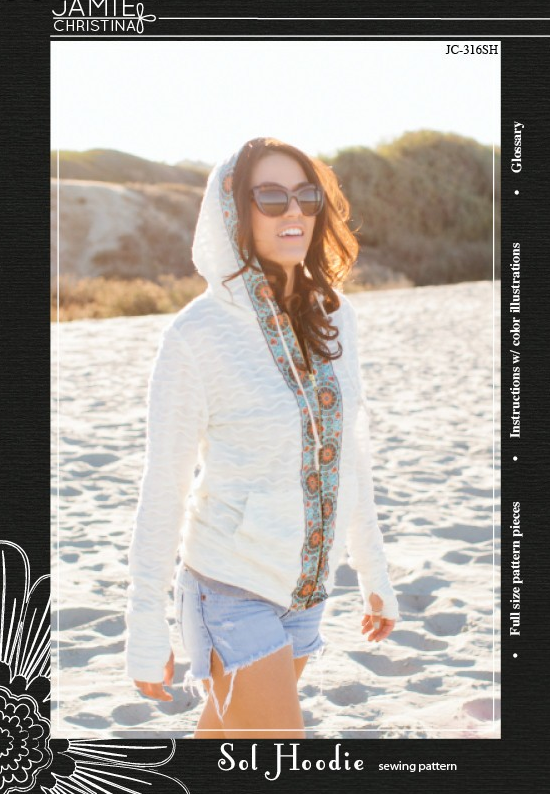 I love this Sol Hoodie pattern by Jamie Christina- I wear hoodies a lot annd the cut of this with the thumb holes at the cuffs is just what I wear! Please save one for me as I definitely want one of these! I can imagine adapting the pattern to make a pullover hoodie for exercise classes. Gorgeous! And the newly released Victoria Blazer by By hand London. 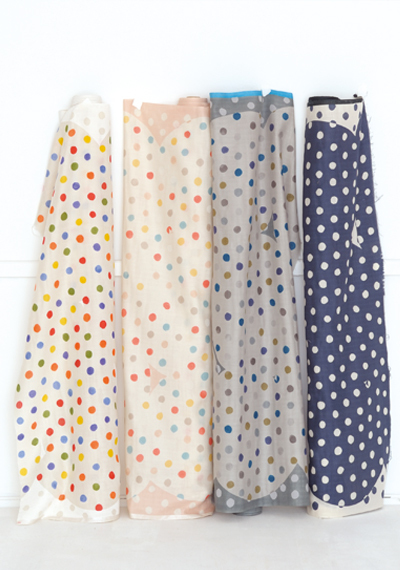 They name all their patterns after the staff members at By hand London- what a lovely idea! A casual blazer which features some great skills to get under your belt- French seams, darts, lining. And as for a little knit inspiration? How about a pair of baby pants made with Nani Iro knit (hard to find now I'm afraid but it would work in any knit) . A free pattern at Made by Rae and pants now being worn by baby Harvey. This is a great pattern to dip your toe into knit/jersey fabrics. An old t-shirt would be enough fabric to make a pair of these and try out knit sewing techniques.